It was reported this week that an arbitrator at the American Arbitration Association certified a plaintiff class of 70 million Verizon Wireless subscribers challenging the $175 early termination fee in their customer agreement. Plaintiffs argue that the fee is an unenforceable penalty provision. Verizon's customer agreement contains a prohibition on class action lawsuits, which the arbitrator found unenforceable. The result is the opposite of that reached in another lawsuit against Verizon, O'Quin v. Verizon Wireless, 256 F. Supp. 2d 512 (M.D. La. 2003), which found that Verizon's arbitration clause was not unconscionable despite its ban on class actions. The ruling is a reminder that mandatory arbitration clauses prohibiting class actions can sometimes be ineffective, depending on the jurisdiction and factual circumstances. It also provides a reminder that liquidated damages clauses in contracts should be carefully drafted in a manner that will not be construed as a penalty provision. Retailer Overstock.com Is Saved by Mandatory Arbitration Clause from Consumer Class Action. Last week, the Australian Competition and Consumer Commission ("ACCC") announced that it is holding public inquiry into the competitiveness of grocery prices in Australia, as mentioned here. Amid concerns that grocery prices are rising faster than the prices of other goods, the inquiry will consider: the current structure of the grocery industry at the supply, wholesale, and retail levels, including mergers and acquisitions by the national retailers; the nature of competition and the pricing practices in the grocery industry; and factors influencing efficient pricing of inputs along the supply chain, according to a press release from the Assistant Treasurer. The ACCC is soliciting public submissions on topics to be detailed in an Issues Paper to be released shortly. As I mentioned in a recent post, concerns have previously been raised regarding the competitiveness of the grocery industry in the United States, including the recent merger between Whole Foods and Wild Oats. Related Post: FTC Approves Mergers after Divestitures: A&P, Schering-Plough. De Beers, a diamond importer and mining conglomerate that controls 40 percent of the world's diamond trade, settled a class action lawsuit for $295 million, after being accused in several state and federal lawsuits of violating antitrust, unfair competition, and consumer-protection laws. Stories on the settlement earlier this week were reported by, e.g., the Chicago-Tribune and UPI. 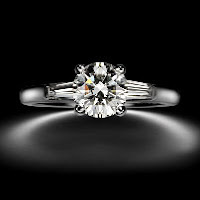 The plaintiffs' complaints alleged that De Beers monopolized diamond supplies and conspired to control diamond prices. E.g., Sullivan v. DB Investments, Inc., No. 04-cv-02819 (D.N.J. June 14, 2004). De Beers continued to deny wrongdoing under the settlement agreement. Of the $295 million, direct purchasers are to receive $22.5 million, and indirect purchasers $272.5 million. Of the indirect purchaser amount, consumers are to receive approximately $135 million, and resellers approximately $137 million. De Beers also agreed to injunctive relief requiring it to "comply with and abide by the antitrust laws of the United States . . . , as well as with the antitrust laws of each of the several states." De Beers marketing campaigns have been wildly successful in increasing the demand for diamonds, with advertising slogans such as "A Diamond Is Forever." De Beers has also succeeded in creating the impression that diamonds are much more rare than they actually are, in part based on their monopolization of supplies. While at first glance $295 million seems like a healthy settlement amount, it is a tiny fraction of the estimated $294 billion total diamond sales during the 12-year class period, and antitrust laws provide for treble damages. If the plaintiffs were willing to settle for such a small percentage of sales, they must have had some serious concerns about their ability to successfully litigate the case. Purchasers are required to submit their claims by May 19, 2008 in order to receive their share of the settlement. Claims forms and settlement documents are available at: https://diamondsclassaction.com/. Delisting Decision - Discount clothing retailer Syms Corp was sued last week when it decided to delist its stock from the New York Stock Exchange in favor of the pink sheets. Syms, which operates 33 stores, said its decision was motivated by an estimated $750,000 in direct annual cost savings from not having to comply with Sarbanes-Oxley ("SOX"). The company also stated that there would be indirect cost savings, as its management team would be more focused on operations. Investors Critical - The decision was roundly criticized by investors, who sent its stock price sharply downwards. The stock was delisted on January 14, and on January 18, a group of shareholders filed suit against the board of directors, alleging a breach of fiduciary duty. See Barington Co. Equity Partners, L.P. v. Syms (N.J. Super. Ct., Bergen County filed Jan. 18, 2008). The shareholders issued a press release about their suit, which seeks to compel Syms to relist on a national exchange. Not Unique - A number of companies have voluntarily delisted from the major exchanges to avoid the burdens of SOX compliance. The costs of compliance disproportionately affects smaller companies, which must devote a greater percentage of their revenue to reporting requirements. Business Judgment Rule - While the board of directors of a public company owes a fiduciary duty to its shareholders, the board generally has broad discretion under the business judgment rule. The rule protects business decisions when the board is acting in good faith on the honest belief that the actions taken were in the best interests of the company. Under the rule, courts will not substitute their own notions of sound business judgment for those of the board of directors. Although short-term shareholder value has been adversely affected, delisting is not per se improper, and the Syms board has a plausible argument that the action is in the best long-term interests of the company. If, however, the board's decision for delisting is for improper purposes, or if the board is not disinterested, then delisting may be forbidden. Avoiding the Risk of Litigation - Despite the discretion provided by the rule, boards of directors should seek legal advice before any action that may adversely affect shareholder value. Legal issues, precedents, and steps that can be taken to avoid litigation risks when delisting, are discussed here. Last week I posted about a class action lawsuit against Overstock.com that was dismissed because of a binding mandatory arbitration clause that prohibited class action lawsuits. I mentioned that there is a split of authority regarding whether or not such clauses are unconscionable. Yesterday, the Ninth Circuit weighed in again, issuing an opinion finding such a clause unenforceable under Washington state law. See Lowden v. T-Mobile USA, Inc., No. 06-35395 __ F.3d __ , 2008 WL 170279 (9th Cir. Jan . 22, 2008), as reported by Reuters. T-Mobile's arbitration clause prohibited class action lawsuits and barred punitive damages, but required T-Mobile to pay most or all of the administrative costs for small claims. Washington Precedent on Unconscionability - The Ninth Circuit relied heavily on a recent Washington Supreme Court decision, Scott v. Cingular Wireless, 161 P.3d 1000 (Wash. 2007). The Scott court had found that a similar class action waiver in a Cingular arbitration agreement was unconscionable, in part because the state "'relied on . . . private class action to correct deceptive or unfair industry practices.'" Moreover, even if Cingular paid the costs of arbitration, this would not make it worth the "'time, energy, and stress to pursue such individually small claims.'" Thus, "'without class actions, consumers would have far less ability to vindicate the C[onsumer] P[rotection] A[ct].'" Preemption Under the FAA – The T-Mobile court also examined whether the Federal Arbitration Act preempted the determination that the class action waiver was unconscionable. In another recent case, Shroyer v. New Cingular Wireless Servs., Inc., 498 F.3d 976 (2007), the Ninth Circuit held that a mandatory arbitration clause with a class action waiver was unconscionable under California law, and also that the FAA did not preempt California law on the issue. Relying on the Shroyer decision, the T-Mobile court found that the FAA similarly did not preempt Washington law. Prevalence of Mandatory Arbitration Clauses in Credit Card Agreements –Justinian Lane posted yesterday on the Tort Deform blog on the topic of "Why are mandatory arbitration clauses so prevalent in consumer credit card agreements?" He examines the argument of tort reformers that companies favor arbitration because it is cheaper than court proceedings. After comparing the filing fees of courts and the National Arbitration Foundation, he finds that arbitration costs are higher. He concludes that, rather than the stated reason of reducing court costs, the real reason that creditors favor mandatory arbitration is to avoid class actions and thereby cut back on class action lawsuits filed against them under consumer protection statutes. While I agree that creditors prefer arbitration clauses in order to avoid class actions, I don't agree with his analysis of the relative overall costs. He suggests that, even factoring in attorneys' fees, it would be cheaper to get a default judgment in court. For example, he assumes that a lawyer can draft a complaint in less than half an hour and get a default judgment in court in 15 to 60 minutes. I don't know any lawyer who can attend a court hearing, wait for his case to be called, get a default judgment, and complete any relevant paperwork in that amount of time, especially factoring in travel time. By contrast, if a defendant defaults in an arbitration proceeding, an appearance before the arbitration panel will probably be unnecessary, along with the accompanying travel time and in-court waiting time. It may be that default judgments are cheaper in arbitration because of filing fees and hearing fees, but the calculation is not as simple as Lane suggests. A 2007 report from Public Citizen provides a more detailed look at some of the relevant costs. Split Authority – For anyone interested in specifically which jurisdictions permit class action waivers, the Scott court provided a partial list. Courts finding class action waivers in arbitration clauses enforceable include: Jenkins v. First Am. Cash Advance of Ga., 400 F.3d 868 (11th Cir. 2005); Iberia Credit Bureau, Inc. v. Cingular Wireless L.L.C., 379 F.3d 159, 174 (5th Cir. 2004); Snowden v. Checkpoint Check Cashing, 290 F.3d 631, 638-39 (4th Cir. 2002); Dale v. Comcast Corp., 453 F. Supp. 2d 1367, 1377 (D. Ga. 2006) (applying Georgia law); Tillman v. Commercial Credit Loans, Inc., 177 N.C. App. 568, 629 S.E.2d 865, 875 (2006); AutoNation USA Corp. v. Leroy, 105 S.W.3d 190, 199-200 (Tex. App. 2003). Courts finding class action waivers in arbitration clauses substantively unconscionable include, for example: Ting v. AT & T, 319 F.3d 1126, 1150 (9th Cir.2003); Skirchak v. Dynamics Research Corp., 432 F. Supp. 2d 175, 181 (D. Mass. 2006); Edwards v. Blockbuster Inc., 400 F. Supp. 2d 1305, 1309 (E.D. Okla. 2005); Luna v. Household Fin. Corp. III, 236 F. Supp. 2d 1166, 1178 (W.D. Wash. 2002); Lozada v. Dale Baker Oldsmobile, Inc., 91 F.Supp.2d 1087, 1105 (W.D. Mich. 2000); Leonard v. Terminix Int'l Co., L.P., 854 So.2d 529, 538 (Ala. 2002); Discover Bank v. Superior Court of Los Angeles, 113 P.3d 1100 (Cal. 2005); Powertel, Inc. v. Bexley, 743 So.2d 570, 576 (Fla. Dist. Ct. App. 1999); Kinkel v. Cingular Wireless, L.L.C., 857 N.E.2d 250 (Ill. 2006); Whitney v. Alltel Commc'ns, Inc., 173 S.W.3d 300, 314 (Mo. Ct. App. 2005); Muhammad v. County Bank of Rehoboth Beach, 912 A.2d 88 (2006); Schwartz v. Alltel Corp., 2006-Ohio-3353 ¶ 36, 2006 WL 2243649 (Ohio Ct. App. ); Vasquez-Lopez v. Beneficial Or., Inc., 152 P.3d 940 (2007); Thibodeau v. Comcast Corp., 912 A.2d 874, 886 (Pa. Super. 2006). Defendants would clearly be better off in the former jurisdictions, and plaintiffs the latter. Related Post: Retailer Overstock.com Is Saved by Mandatory Arbitration Clause from Consumer Class Action. In a recent article in Law.com, Todd King describes his transition from private practice to in-house counsel. Following a two-year clerkship, Mr. King worked for six years at Jones, Day in Atlanta. The opposing party in one of his cases was The Schwan Food Co. After getting to know Mr. King through his representation of their adversary, Schwan hired King as an in-house division counsel. Mr. King experienced two challenges in transitioning to in-house work: (1) being exposed to a number of different issues involving different areas within Schwan – such as marketing, sales, and logistics; and (2) balancing the need to add value to his in-house clients (thereby earning their trust) while maintaining the discipline to push back on ideas or initiatives that involve undue legal risk. I faced challenges similar to Mr. King when I transitioned from private practice to in-house work. It is precisely because of these challenges that I recommend an in-house experience to private practitioners that represent corporate clients. An in-house experience offers robust development opportunities in three areas critical to effectively representing coporate clients. First, attorneys with in-house experience tend to understand markets and industries in much more fundamental ways than attorneys who have spent a career in private practice. Corporate clients would almost certainly be shocked if they knew how many strategic decisions critical to a matter – from the scope of discovery (or due diligence) to understanding all the facts that need to be developed or presented in advocating on behalf of a corporation – are made by private practitioners without a fundamental understanding of the markets/industry at issue. Second, unlike private practitioners, in-house attorneys face a unique challenge: the constant need for simplicity. To be effective, in-house attorneys must make very complex legal issues simple and easy for a lay-person to understand. Twenty-page legal memos summarizing fifty years of precedent are much less valued than a two-page memo that addresses an issue succinctly based on the current state of the law. A two hour oral presentation summarizing complex rules and regulations is much less valued than a thirty-minute presentation cutting to the core of an issue. Brevity and simplicity are critical, just as they are in framing issues for a judge and jury. Finally, an effective in-house counsel must be collaborative. While an in-house counsel has a number of opportunities to work collaboratively within cross functional teams to develop solutions that minimize legal risk, private practitioners have very few opportunities to experience this type of collaboration. As a result, relative to attorneys with in-house experience, attorneys from private practice tend to have more difficulty engaging and relating to senior executives who expect multi-disciplinary collaboration in addressing issues. Earlier this month, the FTC approved final consent orders for the Great Atlantic & Pacific Tea Company's (A&P's) acquisition of Pathmark Stores, and Schering-Plough's acquisition of Organon BioSciences, but only after each acquirer divested certain assets. A&P Acquisition of Pathmark Supermarket Stores - In March 2007, A&P proposed a $1.3 billion acquisition of all of the voting securities of Pathmark, which has about 141 supermarkets along the east coast. Last November, the FTC announced a complaint alleging that the merger would harm consumers in Staten Island and Long Island, New York because the markets are highly concentrated. As a condition for approval of the merger, the FTC required the sale of six grocery stores – five owned by A&P and one owned by Pathmark. Five stores would be sold to King Kullen Grocery Company, and one store to Stop & Shop, a subsidiary of Ahold. After a 30 day public comment period, the FTC announced final approval earlier this month. See In re A&P & Pathmark Stores, FTC File No. 071-0120. Pundits have observed that this decision helps clarify the FTC's stance on supermarket mergers. The FTC's approval of the A&P merger follows its highly-publicized opposition last year to Whole Foods Market's acquisition of Wild Oats because the merger would allegedly eliminate competition in 18 local markets across the country. In that case, a federal court disagreed with FTC's opposition to the merger, and issued an order denying FTC's request for a preliminary injunction. The FTC had defined the product market as premium and natural organic supermarkets, but the U.S. District Court for the District of Columbia rejected that market definition, despite internal documents from Whole Foods' CEO stating that the merger would avoid price wars with Wild Oats. See FTC v. Whole Foods Market, Inc. & Wild Oats Markets, Inc., FTC File No. 071-0114. Schering-Plough's Acquisition of Organon Biosciences - The FTC's case against Schering-Plough is very similar to its case against A&P. The FTC had announced a complaint last November challenging Schering Plough's proposed acquisition of healthcare products company Organon BioSciences for $14.4 billion from Dutch company Akzo-Nobel N.V. because the deal would allegedly harm competition in U.S. markets for the sale of three poultry vaccine in violation of the FTC Act § 5 and the Clayton Act § 7. FTC alleged that the product markets for those vaccines is highly concentrated, with Schering-Plough and a subsidiary of Organon BioSciences each controlling significant market shares. The FTC required divestiture of contracts and intellectual property related to the three vaccines. Final approval of the consent order was granted this month. See In re Schering-Plough Corp., FTC File No. 071-0132. Mandatory arbitration clauses have come under attack recently because they may prevent consumers from effectively vindicating their rights. A case in point is the recent decision Deaton v. Overstock.com, No. 07-cv-643, 2007 WL 4569874 (S.D. Ill. Dec. 27, 2007). Class Action Lawsuit Against Overstock Based on FCRA Violations - A customer of the online retailer Overstock.com claimed that Overstock violated the Fair Credit Reporting Act (FCRA) by displaying on her receipt the last four digits of her credit card and the expiration date (while the law allows the display of the last 5 digits or the expiration date). 15 U.S.C. § 1681c(g). The customer, Shandie Deaton, filed a class action lawsuit against Overstock in federal court in Illinois seeking the statutory damages of between $100 and $1000 per consumer. Id. § 1681n. Deaton alleged that Overstock intentionally continued to use devices that were not compliant with the law. Lawsuit Dismissed Because of Arbitration Clause - In making her purchase, however, Deaton had agreed to Overstock's terms and conditions, including a mandatory arbitration clause, which required arbitration in Salt Lake City before the AAA, and barred class arbitration proceedings, and barred the joining of multiple arbitration proceedings into one case. Deaton argued that the arbitration clause was unenforceable: first, because it made enforcement of her FCRA prohibitively expensive; and second, because it unconscionably prevented class actions, which may be the only effective way for consumers to protect their FCRA rights. The court rejected Deaton's arguments and dismissed her suit, disagreeing with her as a factual matter on her estimate of the costs of arbitration, and observing that the Seventh Circuit has never held that arbitration agreements barring class actions are unconscionable. News coverage of the case is available here. Issues with Mandatory Arbitration Clauses - The court's ruling upholding the class-action prohibition means that the costs for individual consumers in terms of time and effort will drastically limit the number of consumers who will be able to protect their statutory rights. Quite possibly, it will be more cost-effective for Overstock.com to fight FCRA claims in arbitration than it would be for Overstock to purchase FCRA-compliant equipment. This evasion of FCRA requirements is presumably inconsistent with the intent of Congress. In addition to defeating class-actions, arbitration clauses are considered pro-defendant because arbitrations are considered more likely to be decided in favor of defendants, and if the plaintiffs win, the awards are likely to be smaller. These issues were discussed in the recent article "Mandatory arbitration stacks deck against you." I was involved in a successful multi-million dollar arbitration against a retailer a couple years ago, but my client was a sophisticated business rather than a consumer, and the award would likely have been larger if we had been in front of a jury. One arbitration service refused to enforce arbitration agreements that prohibited class actions, but they eventually reversed their policy under pressure from defense attorneys. Legal Opposition to Mandatory Arbitration Clauses - Some organizations have been fighting against mandatory arbitration clauses in the courts. For example, the non-profit organization Public Justice (formerly Trial Lawyers for Public Justice), has been fighting against mandatory arbitration clauses in the courts, through their Mandatory Arbitration Abuse Prevention Project. They have had some successes. (One of my law school friends was involved in some of these cases for Public Justice, which is why I'm aware of their work in the area. Thanks Rich!). Proposed Legislation Limiting Mandatory Arbitration - Other groups have been fighting against mandatory arbitration clauses in Congress, lobbying for new legislation against binding mandatory arbitration. There is now a bill pending in Congress – the Arbitration Fairness Act of 2007 – that would help protect consumers' rights to their day in court by making unenforceable pre-dispute arbitration agreements related to employment and consumer disputes, or arising under statutes intended to protect civil rights or to regulate contracts between parties of unequal bargaining power. S. 1782, 110th Congress. The bill was proposed by Democratic Senator Russ Feingold and Congressman Hank Johnson in July, and the Senate Judiciary Committee held a hearing on the bill in December. See Business fights to keep mandatory arbitration; Bills aim to get consumers their day in court (free subscription). Sample Arbitration Clauses - Unless or until legal reforms are made, retailers can continue to benefit from arbitration clauses with consumers. Sample arbitration clauses to insert into contracts are available on the web sites of arbitration services like the AAA or JAMS. If the clauses are excessively one-sided consumer adhesion contracts, however, they may be unenforceable, depending on the jurisdiction. The law of unfavorable jurisdictions may sometimes be avoided through the use of a choice-of-law provision naming the law of a more favorable state. Such use of contractual choice-of-law provisions as applied to consumer adhesion contracts was criticized in the article: William J. Woodward, Constraining Opt-Outs: Shielding Local Law and Those it Protects from Adhesive Choice of Law Clauses, 40 Loyola L.A. L. Rev. 9 (2006), as mentioned on the Consumer Law & Policy Blog. Advantages and Disadvantages of Arbitration - For contracts between businesses, mandatory arbitration clauses may or may not be advantageous. Arbitration services may charge higher fees for cases that arise under pre-dispute mandatory arbitration clauses, and their fees are many times higher than court fees. Arbitration services may also charge the parties for hearing room rental, arbitrators' time, and other miscellaneous costs. On the other hand, attorneys' fees may be lower because the proceedings are more informal and usually more expedited, and if you're the defendant, you might get a lower award before an arbitrator. Most arbitrations are also confidential, which some businesses may prefer. Cautions for Consumers - For consumers (and plaintiffs' lawyers), take hope in the pending legislation, be careful about what you sign, and before filing suit check whether there is a mandatory arbitration clause (as well as a choice of law and choice of venue clause). I have seen cases where class actions were filed outside the jurisdiction stated in a choice of venue clause, and the defendant counter-sued the named plaintiffs for the defendant's costs of defending the suits outside the chosen venue. (The defendant's counter-suit was eventually dismissed on procedural grounds, but the plaintiffs incurred costs in defending the suit and eventually agreed to a transfer to the specified venue). Filing in court in the face of a mandatory arbitration clause is not likely to lead to a counter-suit, but will likely be fruitless unless you have grounds to defeat the clause. Related Post: Ninth Circuit Finds T-Mobile Mandatory Arbitration Clause Unconscionable. Discovery is scheduled to continue in Insignia Systems' multi-million dollar lawsuit against News America Marketing until July of this year, with trial to follow sometime thereafter. News America Marketing is the player to beat in the free-standing insert ("FSI") and in-store marketing arenas, as mentioned in my earlier post regarding a billion-plus dollar lawsuit brought by Valassis against News America regarding FSIs. News America is part of Rupert Murdoch's conglomerate News Corp, which was the subject of the recent article: Murdoch Issues World Takeover Update. News America, which is worth over a billion dollars, is described by News Corp as "a portfolio of consumer marketing services," and it not only includes FSIs and direct mail, but also a full range of in-store marketing products. Insignia Systems - News America's expansion has come at the cost of smaller competitors, including Insignia Systems, which has a total market cap of about $42 million, just a fraction of that of News America. Insignia Systems introduced in-store price-based signage to CPGs in 1997, and recently printed its 25 millionth sign. Insignia boasts that its POPSigns provide double-digit sales lift because they are point-of-purchase, product-specific signs that advertise the price of the product, and are customized for each store. News America's Alleged Threat to Insignia - Insignia saw its share price rise over 11 dollars in 2002 before plummeting to under 30 cents in 2005, and Insignia blames the drop on unfair competition by News America. In February 2000, News America approached Insignia about a possible partnership agreement. News' Executive VP and CFO David DeVoe Jr. proposed in a letter to Insignia's CEO, Scott Drill that News would purchase up to 40% of Insignia, and proposed that News would act as Insignia's agent in negotiating contracts with retailers. In return, News would ensure that prices paid to retailers would decline, while prices charged to CPGs would increase. According to Insignia, News "threatened to sue and drive Insignia out of the market if Insignia did not agree to News America's monopolistic plan." (Amended Complaint ¶ 18). Alleged Unfair Competition and Lawsuits by News America - Insignia spurned News' proposal to collaborate, and News America introduced a competing product a few months later. News sued Insignia in November 2002, accusing Insignia of interfering with its exclusive contracts with retailers by misrepresenting to retailers the scope and nature of News America's exclusivity rights, and of interfering with News America's contracts with retailers and CPGs by making false statements about the superiority of its advertising products to News America's products. 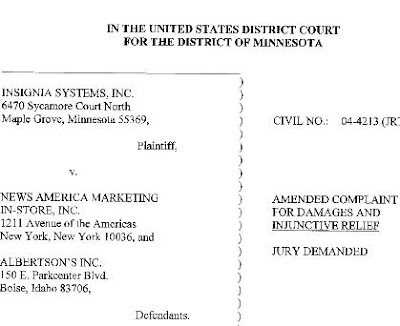 See Complaint, News America Marketing In-Store, Inc. v. Insignia Systems, Inc., No. 00-CV-5843 (S.D.N.Y. filed Aug. 7, 2000). Insignia made antitrust counter-claims, and the lawsuit was settled in 2002 with no monetary payments by either side. News filed another lawsuit making similar allegations in 2003. See Amended Complaint, News Am. Marketing In-Store, Inc. v. Insignia Sys., Inc., No. 03-8555 (S.D.N.Y.). Insignia counter-claimed, alleging that News America engaged in a campaign to exclude Insignia and other competitors of News from the in-store industry by, e.g. : bundling its various advertising programs to prevent Insignia from effectively competing; threatening retailers to stop doing business with News America's competitors; and offering uneconomically large payments to retailers to exclude News America's competitors. News America's Alleged Tactics - In addition to News' aggressive legal tactics, beginning no later than 2001, News America allegedly began an anti-competitive campaign to drive Insignia from the market through various illegal tactics, including: dissemination of false and misleading statements about Insignia's ability to perform on its contracts; falsely claiming authority to remove Insignia advertisements from stores; bundling its various advertising programs to prevent Insignia from effectively competing; threatening retailers to stop doing business with Insignia; and offering uneconomically large payments to retailers to exclude Insignia from the business. (See Amended Complaint, Insignia Sys., Inc. v. News Am. Marketing In-Store Servs., Inc. & Albertson's, Inc., No. 04-cv-04213, at ¶¶ 2-3 (D. Minn. filed Sept. 23, 2005)). For example, News America provided a letter to CPGs stating that Insignia installed less than 20% of the signs CPGs paid Insignia to install, when, in fact, their installation rate was much higher. News America has also entered into long-term exclusive contracts of up to ten years with major retailers for in-store coupon, floor, and shelf advertising and promotions, including price-based shelf advertising. These contracts allegedly excluded Insignia from over 87 percent of the relevant market. (Id. ¶ 26). Further, News America allegedly colluded with Albertson's and other retailers to exclude Insignia so that News could increase its monopoly power and increase prices charged to CPGs, which would then be shared with retailers. Insignia's Lawsuit Against News - In 2004, Insignia filed suit against News America in federal court in Minnesota making these allegations. After News' motion to dismiss the complaint was granted, Insignia in 2005 filed an Amended Complaint. A motion to dismiss the amended complaint was denied in 2006. In December 2006, the State of Minnesota intervened (download order granting intervention) and alleged that News had engaged in deceptive trade practices, adding further credibility to Insignia's case. News' Counter-claims - News filed counter-claims alleging that Insignia wrongfully induced retailers to breach contracts with News, and that Insignia CEO Scott Drill made untrue disparaging statements about News. For example, Drill allegedly stated that News was on a mission to destroy in-store competition, appeared to be getting more aggressive in its sales tactics, and engaged in illegal anticompetitive conduct. News' 2003 New York lawsuit was consolidated with the Minnesota action in February 2007, and News reasserted its New York claims as counterclaims in the Minnesota suit, including tortious interference and unfair competition. Insignia's motion to dismiss the counterclaims was denied. See Insignia Sys., Inc. v. News America Marketing In-Store, Inc., No. 04-4213, 2007 WL 2893374 (D. Minn. Sept. 28, 2007). The ruling, as it pertained to the alleged false statements, is discussed in detail in this post on another blawg: False Advertising About Advertising. Insignia's lawsuit against News America is still pending, with discovery scheduled to end in July 2008. I'm watching the lawsuit with interest, and will post any major developments. Insignia's Business Survival - Despite News' lawsuits against Insignia, and its aggressive competition, Insignia's business has recovered from its lows, and Insignia renewed contracts with retailers such as Kroger and Safeway. Drill gives credit to the lawsuit against Albertson's for giving Insignia leverage with retailers in negotiating such contract renewals. While many businesses shy away from suing their potential business partners, in Insignia's case it seems to have paid off. After three years of losses, Insignia posted a profit in Q1 2006, and its stock has rebounded from 25 cents to about $2.50 today. One article has described Insignia as The Minnesota Company Rupert Murdoch Couldn't Kill. In June 2006, Insignia entered into a partnership with Valassis in which Valassis agreed to promote and sell Insignia's products. That partnership has since been extended to 2017, with Valassis receiving warrants to purchase Insignia stock, as well as commissions on sales. The mutually beneficial arrangement allows the companies to offer a bundled product similar to the bundle of products offered by News -- though News still offers products that neither Valassis nor Insignia offer, such as in-store floor ads and non-price-based shelf advertising. While Insignia has spent over $7 million on the lawsuits, a verdict in favor of Insignia could be very large. How large? One equity analyst called that "the $100 million question," observing that the decline in market cap for Insignia between 2003 and 2005 was more than that amount. Related Post: Valassis' $1.5 Billion Antitrust Suit Against News America Marketing Over FSIs.